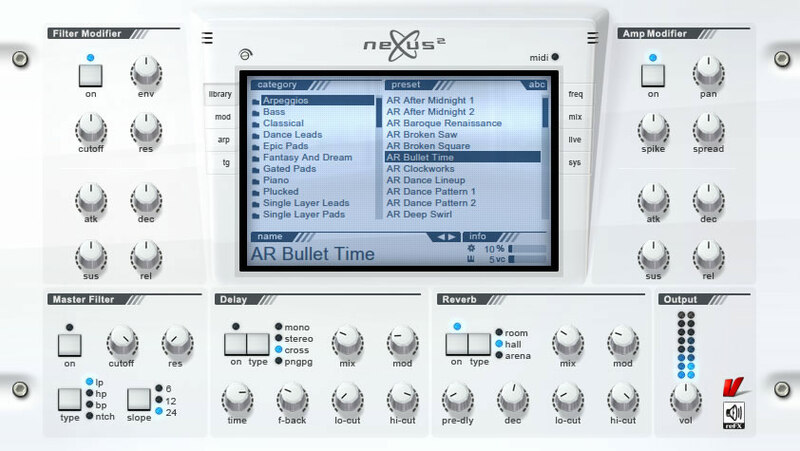 Nexus is a next generation ROM synthesizer. 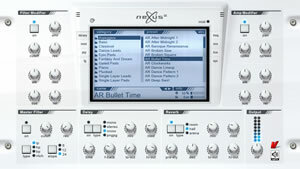 Nexus delivers complex, ultra-fat, contemporary soundstorms. A powerful and flexible architecture is the foundation that supports the immediately useful and spontaneously engaging design of the instrument. Every aspect of Nexus was built to produce music of the highest quality, quickly, with the least amount of fuss. Nexus features a 32-step arpeggiator with note-transposition, a 32-step trance gate, reverb licensed from Arts Acoustic, and a sophisticated modulation-matrix that will help you sculpt the sound. Nexus includes a comprehensive 4GB library of over 880 sounds driven by a friendly internal librarian to find the exact sound you need in the heat of the creative moment. Features like search, favorites, and categorization are standard not only in the factory library but in all available expansions. Nexus offers an array of expansions covering a wide gamut of contemporary music styles and produced by the worlds top sound designers. Nexus is very frugal with the CPU and careful with your RAM. So you want a Free Download? Please not that we will not share any free downloads, Nexus VST is a Paid Download and its against law to share any copyrighted Materials.